Well, those shares that I randomly picked out of the hat in York have now been purchased! 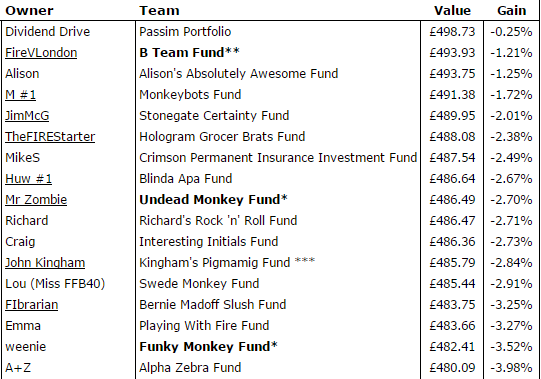 And so commences our very own Monkey Stocks League Challenge! The actual start date of the league is the end of September, since it was too difficult to get everyone to buy (for those purchasing for real, that is) on the same day, so the challenge will end on 30th September 2016. FireVLondon was the first off the blocks, with his big and real purchases (only 10% of the portfolio is showing for league purposes!). His method was to choose the first five shares in the FTSE-350, in alphabetical order, starting with the letters ‘BA’. Cerridwen is scheduled to make her purchases on 23rd Sept. The three of us have gone for the random ‘blindfolded monkey’ method – Cerridwen’s were also picked out of the hat in York, Mr Z’s using Excel’s =RANDBETWEEN function to select a random stock from a different sector. Lou (Miss FFB40) has decided to change her mind about buying for real so it’s just us four stooges intrepid investors with real money in our Monkey portfolios! Bring it on!! For those who selected their shares randomly at the York FIRE Escape gathering (yes, we have a name for these gatherings now! ), all shares have now been ‘bought’ as of 10th September. I’m sure I could have used a different function but this is the one I’ve used across the board for all the virtual stocks. Some of you have given me names for your portfolios – for those who haven’t, I’ve taken the liberty of naming your portfolios – if you don’t like your name or wish to change it, please let me know asap – it just didn’t look very good with a load of ‘To be Advised’ listed! All I can say is, it’s a marathon (that lasts a year), not a sprint and that trading fees (even when only £1.50) affect the value of any share portfolio. Just trying to finalise my googlesheets to see how I can best lay them out etc. I’m going to try to keep track of dividends but it’ll be a big job so if I miss any payments, please let me know so I can update. Same with any dodgy calculations or totals I have on my spreadsheets! Already, I can see there are various October dividends to pay out (most stocks have made ex-dividend, a few haven’t) so I’ll add those into the mix. Well, with the shares bought when the market was mostly down, the only way is up surely, for all our portfolios? This entry was posted in Blindfolded Monkey, Dividend Investing, Monkey, Shares by weenie. Bookmark the permalink. I wrote down the buy prices of mine and Alisons picks yesterday and set up a portfolio on HL to track them. I will post them tomorrow. Great idea, Richard! Yes, let me know the prices – I've got all the portfolios on an spreadsheet at the moment but if you've got your actual prices, I'll take them! I can't wait 'til October 1st when we are all set up and racing together! This will be an interesting experiment for sure! This sounds like an interesting experiment – if its not too late can I enter my 'Mutley's Magic Formula' entry. Rather than shares (which I am offloading) I would like to hold just one low cost tracker fund – Vanguard LS60 (acc). The recent price at which I purchased was £133.50 so after purchase charges, £500 would get me 3.70 units. Good luck with the spreadsheet to keep track of all the entries – that home-made cider may come in handy! I wasn't actually taking on any new entrants but have to say that it would be intriguing to see how the monkey stocks do against a VLS60 fund. So I'll allow you in as an exception, welcome aboard! All the other portfolios will be updated automatically using live Googlefinance feeds; I'll only be able to track yours on a monthly basis when I do the updates. Too much home made cider makes my eyes crossed, no good for spreadsheets haha! How did I miss that you were going to buy your Dog Shares for real, M? Brilliant, thanks! I look forward to the spreadsheet. I didn't even know you could get share prices through Google sheets. This is very interesting news! Yes, the auto-updates on Google Sheets for shares is very handy and will make the league table interesting to follow as share prices move during trading hours. It can get distracting while at work haha!